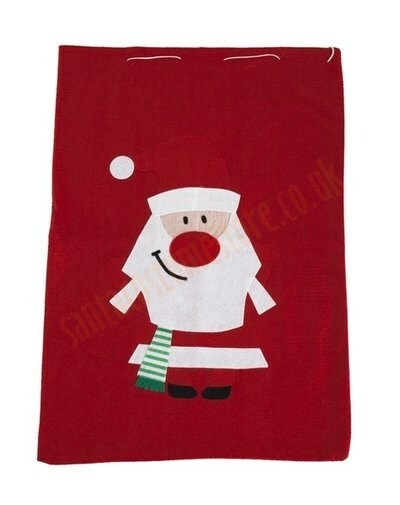 An inexpensive plush Santa suit, in a set that includes a beard, a belt, a sack, boot covers, a bell, gloves and a pair of glasses. The set comprises a Santa suit (jacket, trousers and hat) made of thin and attractively iridescent plush. The jacket itself doesn’t do up, so it has to be tied with the black plastic belt included in the set. And because of the jacket’s cut – with a V-neck – it’s worth wearing a red T-shirt under it. The jacket is tied with a black plastic belt. 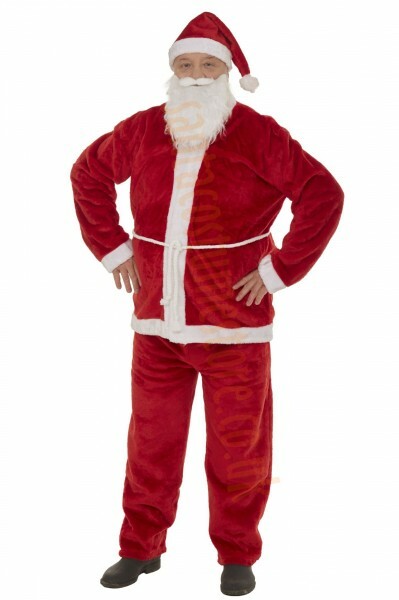 One of the accessories for the suit is a 8'' (20-cm) white Santa beard, featuring a moustache. 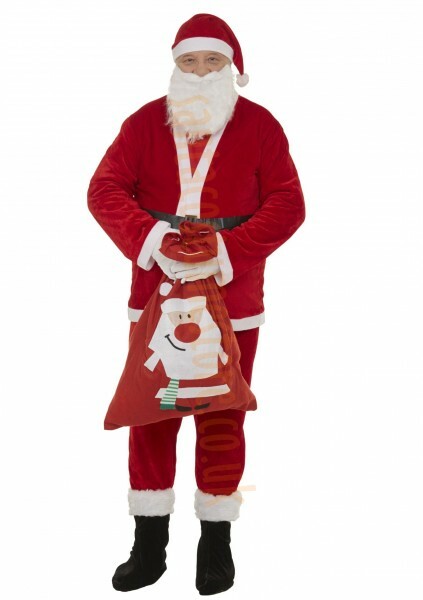 The set also includes a red felt Santa sack (20'' x 28'' / 70 x 50 cm) – the part of the costume that, because of what’s inside, arouses the most excitement. Another essential addition to the Santa suit will be the boot covers, which keep Dad’s familiar shoes hidden, giving the appearance of high-top boots. 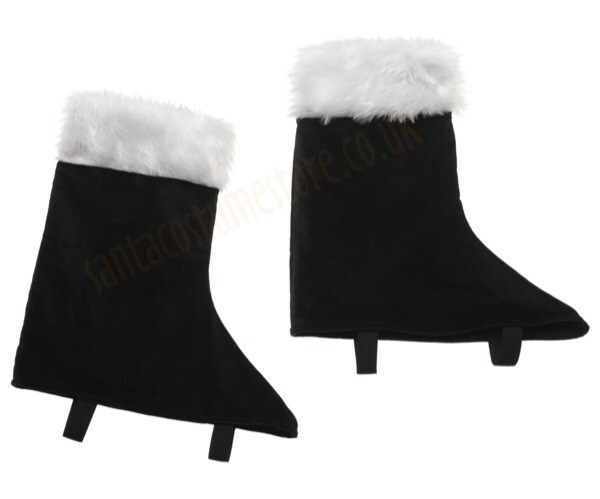 The boot covers are made of black velour, and trimmed with a band of white faux fur. 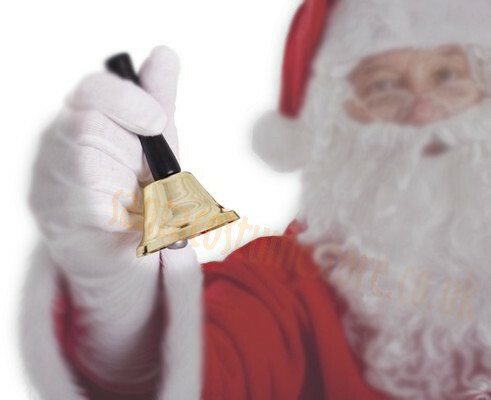 Santa will also undoubtedly find a bell useful, and our set includes a gold-coloured metal Santa bell. 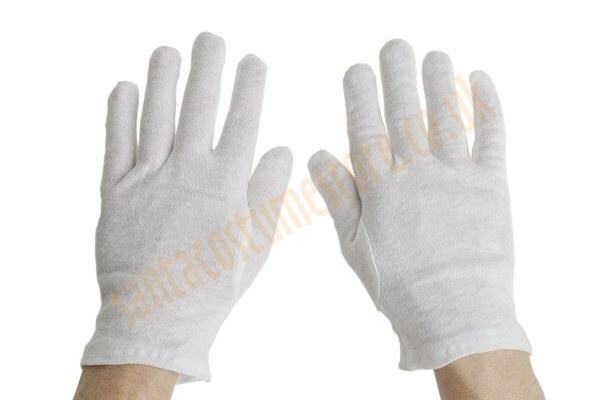 Santa’s gloves, made of white cotton, practically complete the Father Christmas image – as well as giving a touch of elegance to his hands. 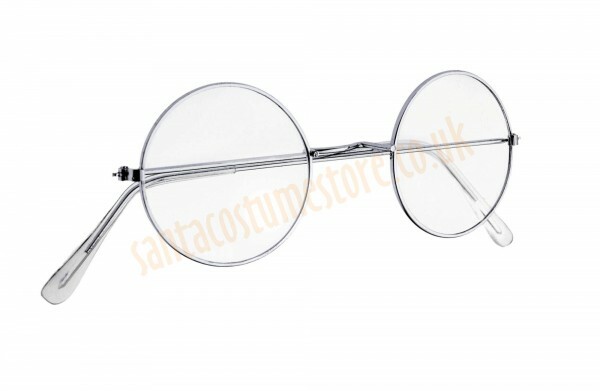 And the icing on the cake comes in the form of our round glasses with neutral lenses, in metal frames. NB: This Santa costume is not meant for heavy use. Neither is it suitable for very tall or very stout wearers. Santa’s wig does not fit under the hat in this set. 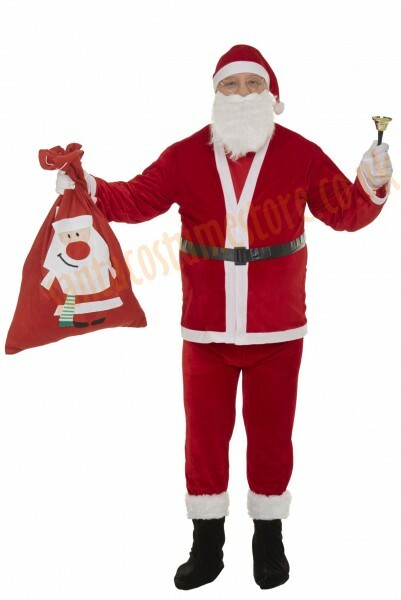 An inexpensive Santa suit with beard, belt, sack, boot covers, bell, gloves and glasses.